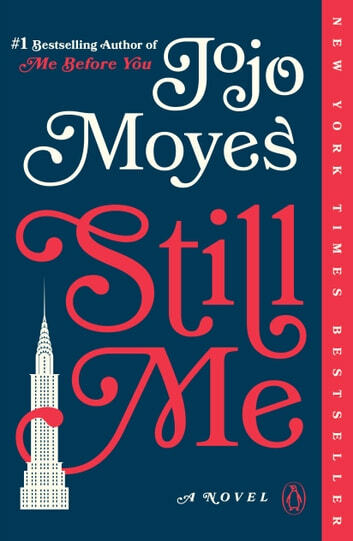 Still Me by Jojo Moyes is the third book in her series, Me Before You . 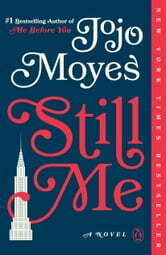 We pick up Louisa's story after she has accepted the New York job offer. Louisa and Sam have agreed to work on their relationship long distance. They have plans to email and video-chat. Visits planned for long weekends. They can do this. They both promised to try. Louisa's life working for the Gopnik family is busy, complicated, she must support the new Mrs. Gopnik out in society as best she can while maintaining a distance of employee/employer relationship. Confident that everything at home is worked out, Lily is with Mrs. Traynor, Treena and Thom are living in her flat in London, Sam is just a phone call or text away. She can do this! We follow Lou through her introduction to New York high society (as the help), see her compassion reach out and work it's magic on those around her, and . see her make the absolute most of what life has to offer her. It isn't long before things take a downward turn but in true Lou Clark fashion we watch ehr handle it with a British stiff(~ish) upper lip and find the best solution for all involved. I couldn't put this down, and absolutely devoured this third installment of Lou's story. Enjoy! I really enjoyed this read. done in 3 nights. Recommended to friends already. Already anticipating the next for the series. (hopeful that there is going to be one. Now I need to read the series again from start to finish, I just couldn't put it down. This book was much better thank the second one. I championed Louisa until the end. Can’t wait for the next instalment.